What is the “rose of Sharon” and who is “the lily of the valleys” as mentioned in the Song of Solomon? We begin with some background. The “rose of Sharon”likely is not a rose as we know the flower. It may have been a crocus, tulip, hibiscus, lily, white daisy or some other flower that grows in a field. (We include a brief discussion about this with flower images later in the post.) Jesus may have spoken of this when he referred to the “lilies of the field” (Luke 12:27,28), meaning some humbler but delicate flower. “It is the bride, then, who is here declaring that she is as one of these common or ordinary flowers of which there were so many. She says, in effect, ‘I am no different and no better than my companions, my sisters, in this great floral throng’ ” (F. A. Shuttleworth, Scot., “The Song of Songs A short series of devotional meditations – No. 1”). The rose and the lily are to be thought of in the collective sense: the “valleys” (plural) would have more than one lily, for example. Many flowers, a class of flowers, is referred to. The virgin class, these common little flowers, realize that God has called them as individuals into His family, and perhaps in time they see why He has picked them because they are poor in spirit, meek, though rich in faith. When they realize that they have this faith, they have a measure of confidence and hope that He really has called them. The HOLY ONE who inhabiteth eternity dwells with the lowly and contrite in heart (Br. Frank Shallieu, Notes on the Song of Solomon, in the Bible Students Library CD). “He proceeds once again to tell her of what and how he thinks of her… ‘As the lily among thorns’ she is seen in harmlessness, simplicity, and irreproachableness in the midst of a crooked and perverted generation (Philippians 2:15) … She isin moral contrast with all her surroundings; He adds no more; His words, though few, give her heart to know that He is content with her; she is what He can delight in; no more is needed. “The Lord would have her follow in His footsteps; as she beholds Him in His beauty, in His fragrance, and His humility, she hears Him say: ‘As I am, so are ye in the world. He that saith He abideth in Me ought himself also to walk even as I walked.’ [See 1 John 2:6.] To be like unto him, she must go down into the fertile Valleys, and there must she abide. She must draw strength and nourishment from the hidden springs and the rich soil of His Word, and His life must flow into her until she blossoms out in His likeness” (Br. Anton Frey, Notes on the Song of Solomon, in the Bible Students Library CD). “Each lily in the company stands for His glory and His delight alone. He has invited many to be the bride; but though many have received the invitation, only a few will He choose” (Br. Anton Frey, Notes on the Song of Solomon). The Thorns– Who or what do these represent? “The ‘thorns’ would be not only worldly people but professed Christians. The ‘daughters’ are the same ‘daughters of Jerusalem’ in Song of Solomon 1:5 and 2:7. Even among nominal Christians who have similar hopes,the virgin class appear as fanatics and oddballs. ‘So is my love among the daughters.’ The word ‘love’ is ‘friend’ in the Hebrew, but of course it has a much deeper meaning than our English word. We sing, ‘What a friend we have in Jesus,’ but he is singing, ‘What a friend I have in my consecrated followers’ ” (Br. Frank Shallieu, Notes on the Song of Solomon). The Bride calls Christ her “beloved.” She is saying that Christ feeds among the lilies. “The ‘lily’ is the common little flower of the lowlands, so Jesus ‘feeds’ (has communion and fellowship) among this humble, meek class. In olden times, receiving hospitality gave one a feeling of security and protection. If you could get into the tent of an enemy and converse with him and plead for mercy, he would never kill you. The safest place would be in the house of the enemy. George Washington, with all of his problems, had a rule that during dinner no strife or unpleasantness could mar the peace or be discussed. A principle of ancient times was not to bring problems to the table of fellowship” (Br. Frank Shallieu, Notes on the Songs of Solomon). “Having once again turned her face toward her dearly beloved Bridegroom‑to‑be, she feels herself reassured, and very happy, yet still too possessive; for she says, as it were, to herself, ‘My Beloved is mine.’ But she is destined to grow both in grace and in the knowledge of her Lord (2 Peter 3:18), until she is able to say ‘I am my beloved’s; and my beloved is mine’ (Song of Solomon 6:3). In the meantime she will have to strive earnestly to make herself really worthy of becoming one day, the Lamb’s wife! True, she has been ‘called’; yea, she has even been ‘chosen’ so to speak; but to be with Him as His Beloved, throughout all the ages of eternity, will depend uponher being‘faithful’(Revelation 17:14). This is a faithfulness in her love of,and for, Him; to have doves’ eyes, to see none other, ever, but ever and always Jesus only!” (Br. Anton Frey, Notes on the Song of Solomon). “She now beholds Him ‘feeding among the lilies.’ In her soliloquy she mentions this, noting that He is almost invariably found ‘feeding among the lilies.’ Regardless of what the flower here referred to may have been, it was undoubtedly intended to represent the ‘pure in heart’ who shall one day see God (Matthew 5:8) — those, who like the wild flowers of the field neither toil nor spin[with distressful anxiety] but who, in accepting whatever divine providence may permitto come unto them, are arrayed even now, in garments whose glory and beauty transcend that of Solomon’s (Matthew 6:28‑29). The espoused virgin seems now to sense the fact that like unto Jehovah of old, who was fed by way of the willing sacrifices of His people upon His altar (See Leviticus 21:17‑21, Psalm 50:14, Hebrews 13:15), so too, her beloved was ‘feeding’ upon the loving consecrations and dedications of the pure in heart. The ‘sweet fragrance’ of these ‘lilies’ is to her beloved, as was the ‘sweet savor’ of the burnt‑offerings and peace‑offerings to Jehovah of old! He gathers the lilies in chapter 6. He delights to gather the saints (who are called lilies) together, and then He comes down to feed among them. He comes into the companies of His saints, when they are thus gathered, to get something for Himself” (Br. Anton Frey, Notes on the Song of Solomon, page 31). The suggestion that the roes “feed among the lilies” is a most beautiful one. The roes are enriched in life and health by what they feed upon; and this shows in their beauty and grace, as well as in the fleetness of foot. “I was like a mother that lovingly nurses her children” (1 Thessalonians 2:7, Way’s Translation). “The ‘two breasts’ speak of affections that are balanced. They set forth symbolically the tenderness and sensitiveness of spiritual affections. Grace governing the heart, would secure this; the one who loves God would love his brother also; and there would be no partialities as to the truth, no attaching ourselves to one aspect of the truth in such a way as to lose interest in the whole circle of truth” (Br. Anton Frey, Notes on the Song of Solomon, page 41). Roes are timid creatures, sensitive to any disturbance and ready to flee from it on swift foot. The Lord wishes us to cultivate and exhibit affections that are delicately sensitive, that are quickly alarmed by the approach of anything that is of the world or the flesh or the devil. This holy sensitiveness can only be preserved as it is nourished upon appropriate food. The garbage of the world is fatal to it. The fawns “feed among the lilies.” This is where He feeds His flock (Song of Solomon 2:16, 6:3). If the spouse is herself a “lily among the thorns,” her affections must feed in conditions that correspond with her true character. How refined the purity of such a feeding‑place! A place where one is surrounded by a beauty and glory that has been directly conferred by God. Where all is in contrast to the thorns around, and is marked by harmlessness, simplicity, and irreproachableness. (See Philippians 2:12‑15.) In such conditions spiritual affections can be suitably nourished. They are conditions which do not pertain to the world nor to nature; they belong to a sphere where all is the product of grace [God’s loving kindness; unmerited/undeserved favor] (Br. Anton Frey, Notes on the Song of Solomon, page 41). “Still blushing profusely under the barrage of the sweet things He has been saying to her, she fain would change the subject. She, therefore, interrupts Him, to tell Him that it will not be too long to wait ere she shall be His forever — to have and to hold! “Until the day break, and the shadows flee away, I will get me to the mountain of myrrh, and to the hill of frankincense” (Br. Anton Frey, Notes on the Song of Solomon, page 41). “It is still night, and the time of His rejection, but we are not children of the night. As children of the day we ardently long for it to come, but there can be no day until He appears who alone can usher it in. Then we shall have done with the night and shadows. Until then, the bride will seek those things which are above, and set her affections on things above, not on things on earth. She wants to be above this world“ (Br. Anton Frey, Notes on the Song of Solomon, page 41). From an Old Testament place name, “Sharon” in Hebrew means “plain,” referring to the fertile plain near the coast of Israel. Flowers growing in such a low‑lying terrain aptly reflect the “beauty” and the “fragrance” of Him, who, though once in the form of God, emptied himself, taking the form of a servant, made in the likeness of man. “Being found in fashion as a man, [he] humbled himself, and became obedient unto death, even the [humiliating] death of the cross” (Philippians 2:6‑8). “Our Lord Jesus, ‘the beginning of the creation of God,’ was willing in harmony with the Father’s plan to humble himself, to take a lower nature and to do a work which would imply not only a great deal of humiliation, but also a great deal of pain and suffering. 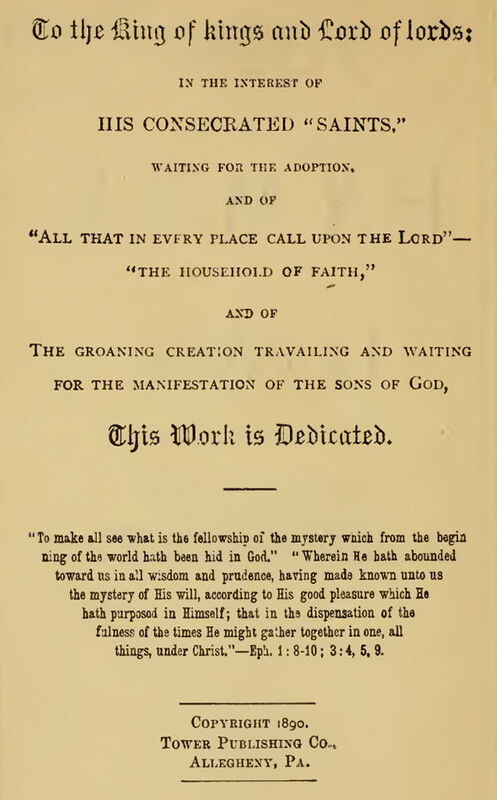 The Apostle points out how the ‘Only Begotten’ proved his willingness and humility by complying with this arrangement; and that after he became a man he continued of the same humble spirit, willing to carry out the divine plan to the very letter, by dying as man’s ransom‑price; and not only so — when it pleased the Father to require that the death should be a most ignominious one in every respect, perhaps beyond the requirements of the ransom merely, he did not draw back, but said: ‘Thy will not mine be done,’ and stooped even to the ignominious ‘death of the cross’ ” (R2228:2). What kind of flower was the “rose of Sharon” and the “lily of the valleys”? The “rose of Sharon” is a name that has been applied to several different species of flowering plants that are valued in different parts of the world. The identity of the plant referred to in the Bible is unclear and is disputed among biblical scholars. Wikipedia says that it does not refer to actual roses, although one of the species it refers to in modern usage is a member of Rosaceae. (1) A crocus — “a kind of crocus growing as a lily among the brambles” (“Sharon,” Harper’s Bible Dictionary) or a crocus that grows in the coastal plain of Sharon (New Oxford Annotated Bible). Gesenius has no doubt that the plant denoted is the Colchicum autumnale (Smith’s Dictionary of the Bible). (2) A tulip — “a bright red tulip‑like flower… today prolific in the hills of Sharon” (“Rose”, Harper’s Bible Dictionary). (3) Tulipa agenensis — the Sharon tulip, a species of tulip suggested by a few botanists. (4) A lily, Lilium candidum, more commonly known as the Madonna lily, a species of lily suggested by some botanists, thought likely to refer to the “lily of the valleys” mentioned in the second part of Song of Solomon 2:1. (5) (Polyanthus) Narcissus — “Rose,” Cyclopaedia of Biblical, Theological and Ecclesiastical Literature. Etymologists have tentatively linked the biblical חבצלת to the words בצל beṣel, meaning “bulb,” and חמץ ḥāmaṣ, which is understood as meaning either “pungent” or “splendid” (The Analytical Hebrew and Chaldee Lexicon). (6) Marshmallows — “W.M. Thomson, in The Land and the Book suggests that what is really referred to by the rose of Sharon is the marsh‑mallow” (Br. Anton Frey, Notes on the Song of Solomon). (8) Anemone — According to F. A. Shuttleworth (in “The Song of Songs A short series of devotional meditations – No. 1,” The Herald of Christ’s Kingdom Magazine, April 1958) in the Eastern world, the lily of the valleys is that flower known in the West as the anemone with its rich petals of red and purple. Here is an image of these (below). What do all these flowers have in common? All these flowers have things in common: simplicity, in natural beauty that reflects God’s perfect love (1 John 4:18); sweet fragrance (2 Corinthians 2:14, 15), that reflects the sweetness of cheerful, willing, patiently enduring sacrifice to bring glory to God by accepting and doing the Heavenly Father’s will; joy, which is infectious, as it brings joy to all who look at their beauty of colour. Their head is either bowed low, reminding us of humble reverence in seeking to know and do the Heavenly Father’s will through Christian servitude in the School of Christ, or held high, reflecting saints who hold high our “head,” Christ Jesus. May God be praised, honored, and glorified in all that is done to please Him through Christ (Matthew 5:16).